A spring weighing scale can be used to measure the weight of an object or a force transmitted through the scale. In the physical sciences, the weight of an object is a measurement of the gravitational force acting on the object. Although the term "weight" is often used as a synonym for "mass," the two are fundamentally different quantities: mass is an intrinsic property of matter, but weight depends on the strength of the gravitational field where the object is located. Recognition of the difference between weight and mass is a relatively recent development, and in many everyday situations, the word "weight" is used when "mass" is meant. For example, we say that an object "weighs one kilogram," even though the kilogram is actually a unit of mass. The distinction between mass and weight is unimportant for many practical purposes because the strength of gravity is approximately the same everywhere on the Earth's surface. In such a constant gravitational field, the gravitational force exerted on an object (its weight) is directly proportional to its mass. If an object A weighs ten times as much as object B, then the mass of A is ten times that of B. This means that an object's mass can be measured indirectly by its weight. (For conversion formulas, see below.) For example, when we buy a bag of sugar we can measure its weight and be sure that this will give an accurate indication of the quantity that we are actually interested in (the actual amount of sugar in the bag). The use of "weight" for "mass" also persists in some scientific terminology. For example, in chemistry, the terms "atomic weight," "molecular weight," and "formula weight" may be used rather than the preferred "atomic mass," "molecular mass," and so forth. The difference between mass and force becomes obvious when objects are compared in different gravitational fields, such as away from the Earth's surface. For example, on the surface of the Moon, gravity is only about one-sixth as strong as on the surface of the Earth. A one-kilogram mass is still a one-kilogram mass (as mass is an intrinsic property of the object) but the downward force due to gravity is only one-sixth of what the object would experience on Earth. Systems of units of weight (force) and mass have a tangled history, partly because the distinction was not properly understood when many of the units first came into use. In modern scientific work, physical quantities are measured in SI units. The SI unit of mass is the kilogram. Since weight is a force, the SI unit of weight is the simply unit of force, namely the newton (N)—which can also be expressed in SI base units as kg•m/s² (kilograms times metres per second squared). The kilogram-force is a derived, non-SI unit of weight, defined as the force exerted by a one-kilogram mass in standard Earth gravity (equal to about 9.8 newtons). The gravitational force exerted on an object is proportional to the mass of the object, so it is reasonable to think of the strength of gravity as measured in terms of force per unit mass, that is, newtons per kilogram (N/kg). However, the unit N/kg resolves to m/s²; (metres per second per second), which is the SI unit of acceleration, and in practice gravitational strength is usually quoted as an acceleration. The governments of many nations, including the United States and the United Kingdom, have officially defined the pound as a unit of mass. The pound-force is a spinoff still common in engineering and other applications; one pound of force being the weight force exerted by a one pound mass when the acceleration is equal to the standard acceleration of gravity. This use occurs, for example, in units such as psi, or in the measurement of jet engine thrust. In United States customary units, the pound can be either a unit of force or a unit of mass. Related units used in some distinct, separate subsystems of units used in calculations include the poundal and the slug. The poundal is defined as the force necessary to accelerate a one-pound object at one ft/s², and is equivalent to about 1/32 of a pound (force). The slug is defined as the amount of mass that accelerates at one ft/s² when a pound of force is exerted on it, and is equivalent to about 32 pounds (mass). To convert between weight (force) and mass we use Newton's second law, F = ma (force = mass × acceleration). Here, F is the force due to gravity (i.e. the weight force), m is the mass of the object in question, and a is the acceleration due to gravity, on Earth approximately 9.8 m/s² or 32 ft/s². In this context the same equation is often written as W = mg, with W standing for weight, and g for the acceleration due to gravity. The weight force that we actually sense is not the downward force of gravity, but the normal (upward) force exerted by the surface we stand on, which opposes gravity and prevents us falling to the center of the Earth. This normal force, called the apparent weight, is the one that is measured by a spring scale. If there is no contact with any surface to provide such an opposing force then there is no sensation of weight (no apparent weight). This happens in free-fall, as experienced by sky-divers and astronauts in orbit, who feel "weightless" even though their bodies are still subject to the force of gravity. The experience of having no apparent weight is also known as microgravity. A degree of reduction of apparent weight occurs, for example, in elevators. In an elevator, a spring scale will register a decrease in a person's (apparent) weight as the elevator starts to accelerate downwards. This is because the opposing force of the elevator's floor decreases as it accelerates away underneath one's feet. Weight is commonly measured using one of two methods. 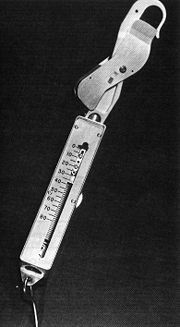 A spring scale or hydraulic or pneumatic scale measures weight force (strictly apparent weight force) directly. If the intention is to measure mass rather than weight, then this force must be converted to mass. As explained above, this calculation depends on the strength of gravity. Household and other low precision scales that are calibrated in units of mass (such as kilograms) assume roughly that standard gravity will apply. However, although nearly constant, the apparent or actual strength of gravity does in fact vary very slightly in different places on the Earth. This means that same object (the same mass) will exert a slightly different weight force in different places. High precision spring scales intended to measure mass must therefore be calibrated specifically for location. Mass may also be measured with a balance, which compares the item in question to others of known mass. This comparison remains valid whatever the local strength of gravity. If weight force, rather than mass, is required, then this can be calculated by multiplying mass by the acceleration due to gravity—either standard gravity (for everyday work) or the precise local gravity (for precision work). Hipschman, Ron. 1997. "Your Weight on Other Worlds" San Francisco, CA: Exploratorium. Retrieved December 15, 2007. Nave, Carl R. 2006. "Mass and Weight" Hyperphysics. Taylor, B. N. 2004. "Guide for the Use of the International System of Units (SI)" National Institute of Standards and Technology. This page was last modified on 9 August 2013, at 23:26.